In class this week our topic is one of my favorite things, the Passive House standard. Started in Germany as “Passivhaus” roughly 20 years ago, and validated as a way to create buildings that use as much as 90% less energy than their code-built counterparts, this is a simple way of building more energy-efficient, sustainable structures. The gist of the Passive House standard is to build airtight buildings, with lots of insulation, reduce thermal bridging, and then ventilate, ventilate, ventilate! By building more airtight structures, we ensure that these buildings don’t lose as much heating or cooling energy through cracks or gaps in the walls… but we also must provide a ventilation system that brings in fresh air, to reduce the likelihood of mold growth and generally support human health. In discussing the Passive House standard, we learned that there are probably as many as 25,000 Passive House structures all around the world, the majority of which are in Europe, and only a handful of which are in North America. One of these buildings is the Smith House in Urbana, Illinois, the first Passive House built in the U.S. in 2003 by Katrin Klingenberg, who literally wrote the book on Passive House. 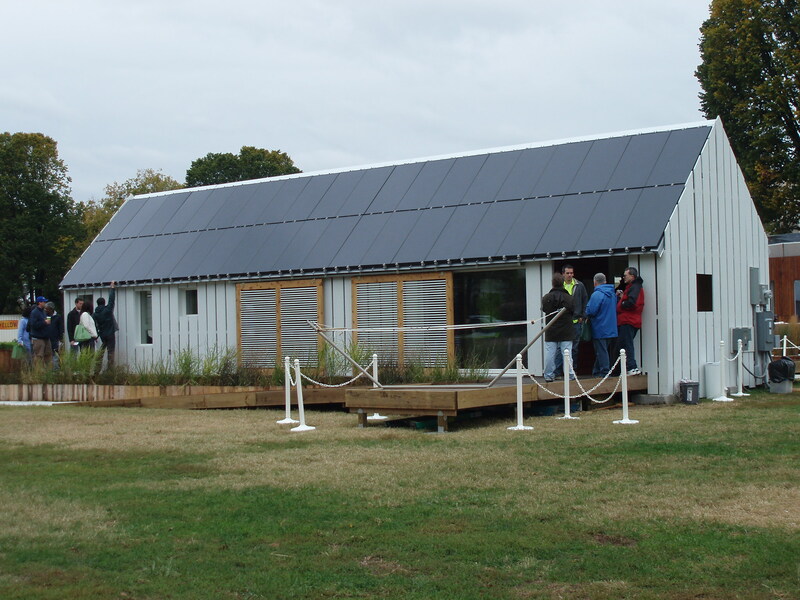 Another Passive House is the University of Illinois at Urbana-Champaign’s Solar Decathlon house from 2009, also known as the Gable Home. This house came in second in the 2009 Decathlon to Team Germany, who won their second Decathlon in a row. 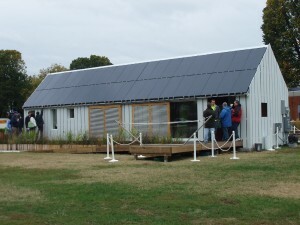 We took this opportunity to talk about the technology and building science on display at the Solar Decathlon, and how great an event this is for green home designers and enthusiasts alike. You can see more photos and read about my thoughts from immediately after the last event here. Finally we got to the issue of our field trip this week to the Everhart Passive House in SE Portland. The Everhart family has put a lot of time and effort into the retrofit of their house into a Passive House, and they are extremely generous for opening their home to our class. For Assignment #5, we’ll be modeling the Everhart home using the Recurve modeling tool. Students are encouraged to bring a tape measure and their sketchbooks, and to “divide and conquer” spaces in the home to find inputs for all the rooms in the most efficient way possible. See you at 10:30 on Thursday morning! Passive houses can be constructed from dense or lightweight materials. Some internal thermal mass is normally incorporated to reduce summer peak temperatures, maintain stable winter temperatures, and prevent possible over-heating in spring or autumn. Thank you for spending the time to share this, I feel strongly about it and love studying more about this topic. Please keep updating your page with additional information.